Sometimes just the graphic patterns of rock itself can make for an interesting picture. Take a moment to simply peer into the scene above and no doubt your mind will try to make sense of it all. Does it look like a little baby is over here in this part or maybe an alien's head is up there in that part? How about a hand or face down there? I wonder about the winds and waters over time that helped bring about the "art-look" in the underside of this arch formation. Lines, colors, patterns and textures are the things that stand out to the eye of a photographer like myself. 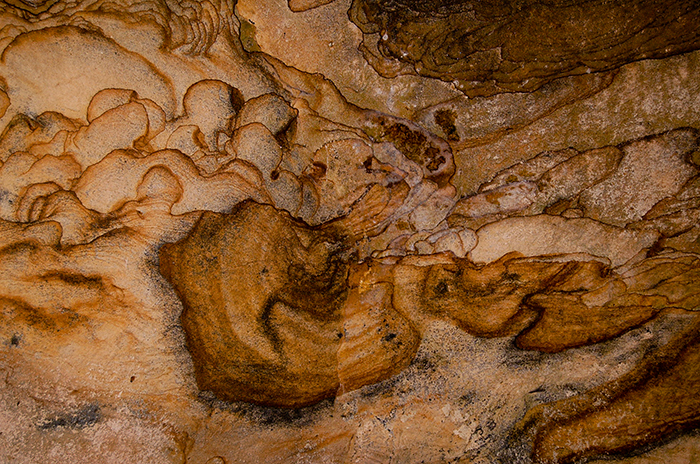 Each viewer's thoughts on the image or what they see in the rock is all that matters.